Don't let this great deal pass you by! 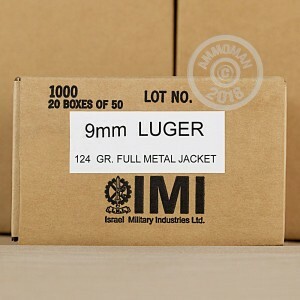 9mm FMJ IMI ammo is just what you need for your 9mm pistol or sub-machine. Israeli manufacturer IMI produces great, reliable, and affordable ammunition for all your range training needs. This 124 grain full metal jacket projectile will give you the accuracy and dependability you expect when you spend the day at the range. These 1000 rounds are great for use both indoors and outdoors. Each cartridge contains a Boxer-primer and smooth brass casing, sure to load and fire with ease and consistency. Your 1000 rounds will arrive to you in brand new condition, ready to shoot. 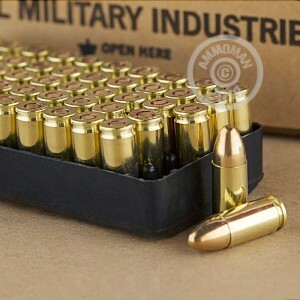 Israel Military Industries, founded in 1933, produces great quality ammunition for an affordable price. Their products have been qualified with the IDF, US Military (Air Force, Army, and Navy) and NATO nations. They are fully owned by the Israeli government. Best ammo I have ever fired from a fantastic manufacturer. IMI knows what they are doing. I only wish I ordered more. Have fired 5000+ rounds of this through a Sterling Mk4 SMG.Not a single hiccup OR misfire.Finest quality on the planet PERIOD! 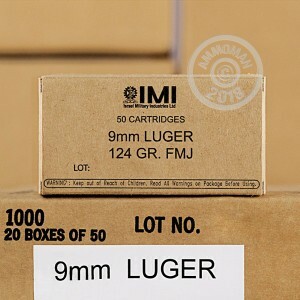 I will buy IMI ammo again. Excellent performance in various platforms including, glock 17,19, cz SP01, Sig 226,228. Performance is consistent, pricing is very competitive, but the best part of this was the very fast shipping. Totally surprised it arrived so quickly. Went shooting with a friend. My Beretta worked perfectly on these rounds, but my friends HK had to strike a lot of the rounds twice before firing. Not sure if the primer on these bullets just need more hammer strength, but seems like it would be a crap shoot for anyone's gun. This is THE best quality 9mm on the planet PERIOD!